"We've come to take Sigma Octanus IV back from the Covenant. To do that, we're going to kill every last one of them." The Battle of Sigma Octanus IV was fought between the United Nations Space Command and the Covenant in mid-2552. Despite taking heavy losses, the UNSC successfully repelled the Covenant force from the Sigma Octanus system, gaining a victory. However, multiple Covenant objectives were achieved, as they succeeded in retrieving a Forerunner artifact leading them to Installation 04, as well as finding out the location of the human stronghold planet Reach. On July 17, 2552, Ensign William Lovell logged a large gravitational anomaly inside Slipstream space. Deciding that it could not be any form of Covenant starship based on its immense size, Lovell passed it off as an asteroid, sent his hourly report, and thought nothing more of it. However, over Sigma Octanus IV, Commander Jacob Keyes, commanding officer of the UNSC Destroyer Iroquois, realized that the large mass was in fact a battle group of Covenant ships after reading a report by Fhajad-084. The Covenant ships were flying in close formation; large masses bend slipspace more easily than in real space, creating the illusion of a single large mass when there are in fact several. Keyes concluded that the mass was comprised of four Covenant Frigates. However, when the Covenant battlegroup exited slipspace, the Iroquois found itself outmatched by the arrival of not four frigates but one DDS-class carrier, one destroyer, and two frigates. Despite the hopeless tactical situation, Commander Keyes resolved to attack. The Iroquois set a collision course for the destroyer at emergency acceleration while launching a nuclear warhead in what seemed to be the wrong direction. The two escorting frigates proceeded to launch a salvo of plasma, but the Iroquois managed to evade by utilizing the emergency thruster. Having missed their target, the plasma came about and continued to track and home in on the UNSC warship. The trailing plasma was to prove critical to the success of Keyes' strategy. A last minute course correction allowed the Iroquois to merely "graze" the destroyer's shields rather than smash directly into the ship properly, resulting in the destruction of a large portion of the Iroquois' armor (Keyes had torn through 2 meters of titanium and had breached every bottom deck of the Iroquois). However, the tracking plasma was unable to correct for the sudden maneuver of their target and, in consequence, impacted on the destroyer instead. A heavy salvo of Archer missiles sent the remaining Covenant warship to its destruction. With the momentum built up during the first phase, the Iroquois performed a slingshot maneuver around the planet. Once safely away, the nuclear warhead deployed earlier, was detonated, completely draining the shields on the two frigates. Having completed its orbit, the Iroquois resumed its attack and destroyed the two frigates with two heavy MAC rounds and hundreds of Archer missiles. Its escorts destroyed, the carrier then disengaged and escaped out system but not before leaving 34 dropships and a small ship to continue the ground assault. Harland's fireteam overlooking the besieged city of Côte d'Azur. With thousands of Covenant soldiers deployed on the ground, and the city of Côte d'Azur in their hands, 1600 Marines under General Kits were sent in. A small deployment of Orbital Drop Shock Troopers dropped alongside the Marine force, but did not participate separately from the marines; Devesh Bhasin died during the drop due to malfunctions in his Single Occupant Exoatmospheric Insertion Vehicle. Upon landing, the Marines set up their command center, Alpha Headquarters and a forward base, Firebase Bravo. The troopers were forced to operate with little intelligence of the surrounding area. Satellite scans were rendered useless by the fog and jungle canopy. Kits failed to realize that the Covenant had established a strong presence in the jungle, including Mgalekgolo. Lieutenant McCasky was ordered to take his platoon to observe Covenant activity in Grid 13 x 24. They traveled to the area by Warthog, but almost the entire platoon was wiped out by Mgalekgolo save for Corporal Harland, Privates Fincher, Walker and Cochran. Harland ordered a retreat as soon as he clearly saw the Mgalekgolo, but despite this Cochran was still wounded by a Needler. Although hounded by Banshees, the fireteam managed to destroy all pursuing Covenant and fall back safely. They found that Firebase Bravo had been completely overrun by Covenant forces and its survivors were systematically being hunted down and slaughtered. When they made it back to Alpha Headquarters, they found that that had also been mostly destroyed, with only fourteen enlisted men surviving on the planet's surface. Corporal Harland was forced to assume command. With the failure of the Marine strike team, the Spartan-IIs were sent in as part of an operation designated OCEAN BREAKER. Arriving at the destroyed H.Q., the squad, consisting of John-117, Frederic-104, James-005, Kelly-087, Joshua-029, Linda-058, and six others quickly secured the base. After they arrived, Spartan 117 broke them into three four-man teams and personally assumed command of Blue Team. He sent Red and Green teams on their missions, then slogged through the jungle, arriving at Côte d'Azur. Entering the storm drains, Blue Team discovered several Huragok. Investigating Covenant activity in the Côte d'Azur Museum of Natural History, Blue Team discovered that the Covenant were scanning what appeared to be a simple piece of igneous rock, and sending the information to a ship in orbit. 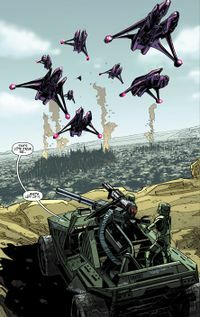 The team entered a protracted firefight with two Mgalekgolo, which was a victory at the expense of James' arm, recovered the rock, and escaped. With a group of surviving civilians evacuated, the SPARTANs returned to H.Q. and detonated a HAVOK nuclear warhead, destroying Côte d'Azur and removing the Covenant presence on the planet. Other cities on the planet would be destroyed, such as Caracas, Huiren, Silma and Enfield, either due to similar Covenant invasion or to preemptive destruction by the UNSC to deny the Covenant the objects they sought. The UNSC fleet engaging the opposing Covenant fleet over Sigma Octanus IV. With the ground battle continuing, more UNSC ships arrived in orbit over Sigma Octanus IV. At 0625 hours, a fleet of Covenant vessels were detected on the edge of the system. The 48 available UNSC warships, including the Iroquois and Stanforth's flagship, the Marathon-class cruiser Leviathan, formed a tight "checkerboard" formation that allowed for them to fire all their MAC guns simultaneously at the Covenant fleet with a single massive volley. However, this restricted the mobility of the UNSC fleet, and left them unable to evade the extremely accurate Covenant plasma torpedoes. When the battle commenced, the Covenant fleet took a severe beating from the UNSC's opening MAC salvo, but promptly returned fire with a salvo of plasma torpedoes. The repair station Cradle moved in front of the UNSC formation, acting as a sacrificial shield, and absorbed the Covenant fleet's first salvo, at the cost of the station and its entire crew. This allowed the UNSC ships to dedicate all the power from their reactors to recharging their MAC guns, and the UNSC ships were thus quickly able to fire a second salvo after the destroyed Cradle drifted away. After this salvo, only eight Covenant vessels remained: cruisers and destroyers. The UNSC fleet then scattered and proceeded to engage the Covenant fleet, which responded by releasing its Seraph fighters and opening heavy fire on the UNSC ships. The Iroquois spotted a small Covenant stealth craft in orbit above the planet and attempted to destroy it with a barrage of Archer missiles, but the attack was foiled when the stealth ship jammed the missiles' guidance locks, causing them to miss. In response, Iroquois simply rammed the ship, stopping the Covenant from gaining planetside data. The remaining Covenant vessels soon fled the system. 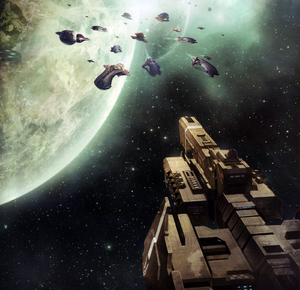 The battle was one of the few major victories that the UNSC had in space (despite major losses; less than ten ships remained intact after the battle) since Harvest was retaken. Admiral Stanforth had especially planned this battle to be a much needed victory and morale boost for humanity. It introduced the tactic of using a refit station to protect UNSC ships. The Covenant, however, had only come for the data retrieved from the Forerunner crystal transmitted from the planet, which revealed to them the location of Installation 04. A spy probe attached to the destroyer Iroquois led the Covenant to Reach, which they attacked a few days later. It later transpired that the Covenant had learned the location of one of the Halos from the transmission, which they planned to activate to begin the Great Journey. As a result of the battle, there were much debris left in orbit around Sigma Octanus IV. HAZMAT teams swept the area but the area around the planet would remain a navigational hazard for the next decade. 0000 Hours: Ensign William Lovell, aboard the UNSC Remote Scanning Outpost Archimedes, reports to Sigma Octanus IV concerning a large silhouette in Slipspace heading for the system. It is suspected to be a group of Covenant ships but it could also be an asteroid. 0300 Hours: The UNSC Iroquois arrives in system on patrol. The vessel's Commanding Officer, Commander Jacob Keyes, receives the sensor information and realizes it is a Covenant threat. He contacts FLEETCOM and informs them of the situation. 0320 Hours: 4 Covenant ships consisting of 1 DDS-carrier, 1 destroyer and 2 frigates arrive in the system. The UNSC Iroquois engages the enemy and requests reinforcements. The UNSC Gettysburg and UNSC Allegiance respond and begin heading for Sigma Octanus. 0330 Hours: The Iroquois destroys all Covenant vessels save for the carrier using a maneuver later known as the Keyes Loop. The carrier launches landing craft toward Sigma Octanus IV, then retreats into slipspace. 0345 Hours: Covenant ground forces invade the city of Côte d'Azur on the planet. 0500 Hours: 47 additional UNSC vessels arrive in the system. Admiral Michael Stanforth, aboard the UNSC Leviathan, takes command. 0600 Hours: Covenant forces ambush and obliterate all marine forces on the ground. Only 14 enlisted men survive. Corporal Harland assumes tactical command. 0625 Hours: Covenant vessels begin appearing on the far edge of the system. 0650 Hours: SPARTAN-IIs arrive on the surface to reinforce surviving marines. 0900 Hours: Spartans assume tactical command on the ground. 1800 Hours: Spartans and marines begin a counterattack on Côte d'Azur. 2010 Hours: Spartans arm nuclear device below Côte d'Azur. 2039 Hours: Nuclear warhead destroys all Covenant ground forces at Côte d'Azur. 2120 Hours: General quarters is sounded aboard ships and the opposing Fleets close to engage. 2130 Hours: Repair station Cradle moves to protect UNSC Fleet. First salvos are fired by Covenant vessels. 0500 Hours: All Covenant vessels either retreat or are destroyed. Battle concludes. There is a discrepancy over the timing of the battle in Halo: The Fall of Reach: Chapter 19 begins at 0600 hours while Chapter 20 begins at 1800, yet there seems to be no significant lapse of time between them. Chapter 22 Begins at 2010 Hours and Chapter 23 begins at 0500 hours. Despite this, all four chapters are stated to occur on July 17. This may have been a typographical error, with Chapter 23 meant to be on July 18 or, perhaps, to serve as a flashback of sorts. Chapter 19 clearly begins much later than 0600, since the marines were deployed at 0600; even if their bases were set up almost instantly, they still took "a couple hours" to get from the firebase to grid 13x24. Page 156 of Halo: The Fall of Reach states that Cradle was over a square kilometer and that three destroyers could be eclipsed by its shadow. Exactly how it could cover the entire UNSC fleet present is not made clear. The UNSC ships may have positioned themselves behind the Cradle in a specific formation for maximum protection. It is also possible that repair and refit stations are larger than one square kilometer, as stated in the novel. Early copies of the first edition of Halo: The Fall of Reach state that the Battle of Sigma Octanus IV and the Fall of Reach both occurred in 2542. However, this was soon confirmed to be a typographical error and fixed in later copies. However, as the 2010 re-issue used an older copy as basis, several errors, this included, were re-entered into circulation. This error was again fixed in the Definitive Edition released in 2011. The UNSC Fleet bears down on the attacking Covenant, supported by the Cradle as it moves to shield the human ships from attack. The UNSC Iroquois unleashes a volley of Archer missiles against the Covenant stealth ship. The Iroquois rams the Covenant stealth vessel. UNSC and Covenant ships battle. ↑ The ships fired a salvo of 63 MAC rounds (Halo: The Fall Of Reach, page 193), thus 15 ships must have had 2 MAC guns. ↑ ONI Candidate Assessment Program V5.02A, "Search terms", under "D"